Where should the USMNT play? Last Friday, the United States lost a huge game against Costa Rica in World Cup qualifiers and the numbers that go with that defeat are shocking. For example, according to ESPN’s Soccer Power Index, team USA’s chances of qualifying to Russia 2018 fell to around 80 percent and if they were to lose next game against Honduras, the chance of qualifying would be around 59 percent. Paul Carr, senior researcher for ESPN, tweeted more about the defeat. “Before two home losses in the Hexagonal, the USMNT had one home loss in 50 World Cup qualifiers since 1990,” Carr tweeted. With the win, Costa Rica became only the second nation to earn three points on American soil after Mexico. 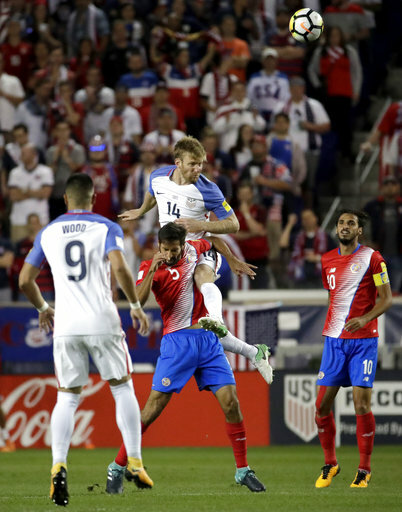 Bruce Arena’s squad didn’t play poorly by any means, but they were out-competed, out-coached and out-hustled by a Costa Rican team who recovered from the Gold Cup defeat the United States had inflicted on them just a month ago. Captain Bryan Ruiz was phenomenal on the ball. He always got the ball free and knew where to go. The defense was tight and focused throughout the whole game and when Keylor Navas was called to make saves, he did. In the second half, when the United States had begun to attack, Navas kept a ball away with his leg and hand after he threw himself in the opposite direction. It was the save of the game and left team USA frustrated. Wonder kid Christian Pulisic had his worst game in a year and Clint Dempsey couldn’t do what he normally does on the ball. Instead, he almost got himself ejected from the game with a classless elbow to one of the Costa Rica players. Costa Rica’s forward, Marcos Ureña, stung the American defense in key moments during the game and the United States fell apart. The United States had 61 percent of the possession, recording 14 shots, two of which were on goal. Costa Rica had nine shots throughout the game and two on goal. Both shots ended up in the back of the net. But no one seems to be talking about these as much as they should be. The conversation is around the ticket distribution and the fact there were a lot of Costa Rican fans at Red Bull Arena. Media analysts like Fox Soccer’s Grant Wahl went as far as saying New York area will not get another qualifier game. Neither will Columbus, Ohio because of last November’s defeat against Mexico. So this begs the question, where can the United States play where they will have home-field advantage? Well, I seem to think this is a quite stupid question to focus on after the team was beaten and had a reality check after 13 straight games without losing since Arena took charge of the team. If you are good enough to play on your national team, you should be good enough to play with a pro, anti or in-between crowd. It’s not like the United States is going to have fan advantage in Russia next summer. But let’s entertain this question for a bit. Where would be a good venue for the United States against a team like Mexico or Costa Rica? Well California, Texas, New Mexico and the border states are already out because of the proximity to Mexico and the many Mexican-Americans that live there. The New York area proved not to be ideal. Florida? Also not good. Chicago? Also draws big crowds for Mexico. So, I think the only logical choice left is Alaska. There you wouldn’t get opposing teams’ fans. You probably wouldn’t even get a lot of USA fans. So instead of focusing on the fan aspect and what venue the team should play in moving forward, maybe it’s time to leave the excuses behind and really focus on what the United States lacks as a team. Is there a generational change? Are the forwards in good shape? Are they in good enough shape to play a team like Germany in the World Cup? Team USA will get on a plane and play Honduras in hot and humid San Pedro Sula and if they lose there will be no excuse for jeopardizing their place in Russia next summer.